When I started watching films which dealt with the classical stories involving Hindu Gods and Goddesses, I noticed a number of parallels with the legends I heard as a child growing up in Ireland. There are many books and articles which deal with the similarity between the two cultures, but every time I watch one of these films it strikes me all over again and is probably one of the reasons why I love these mythological films. The lavishness of the sets and the stunning costumes are other reasons to watch and enjoy but I really do appreciate the stories and the opportunity to learn more about the Hindu pantheon of Gods. 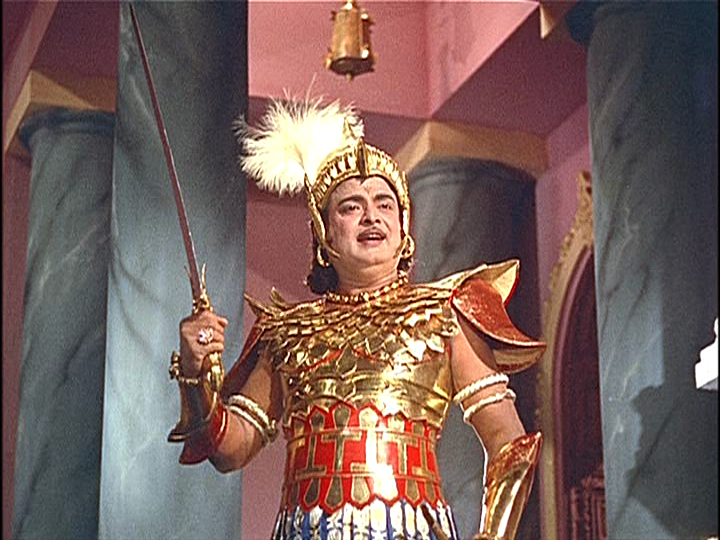 A. P. Nagarajan made many successful mythological films in the sixties, and I’m hopeful that after the recent success of the restored classic Karnan some of Nagarajan’s films will get the same treatment and become more readily available with subtitles. Saraswathi Sabatham is a little different from the other Tamil mythological films I’ve seen, as it uses a fictitious plot rather than stories from the Sanskrit epics. It still draws on the personalities and traits of the various Gods and there is a strong message behind the narrative but it’s a simple story which is charmingly told. 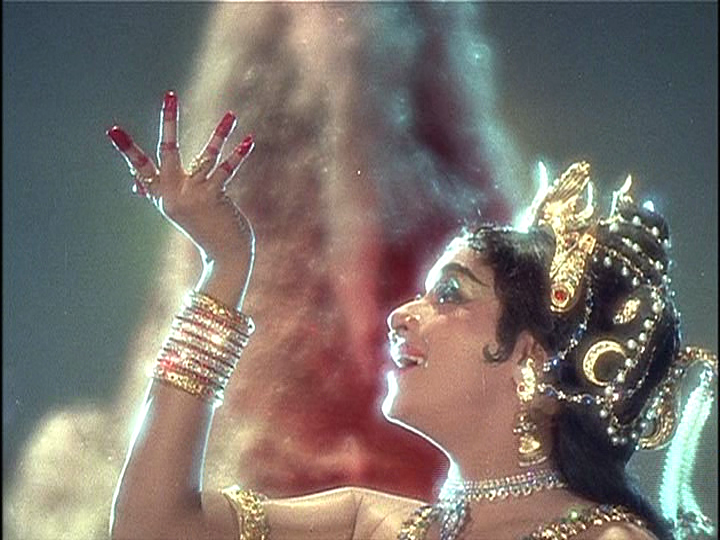 The film opens with a lovely song featuring the Goddess of Knowledge, Saraswathi (Savitri) and her attendants. 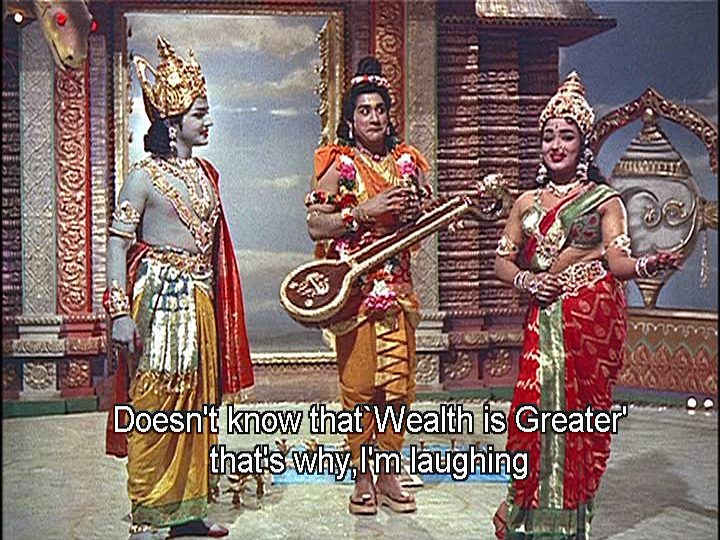 Trouble enters into this beautiful and peaceful scene in the form of the sage Naradha (Sivaji Ganesan) who goads Saraswathi by claiming that wealth is more important than knowledge. 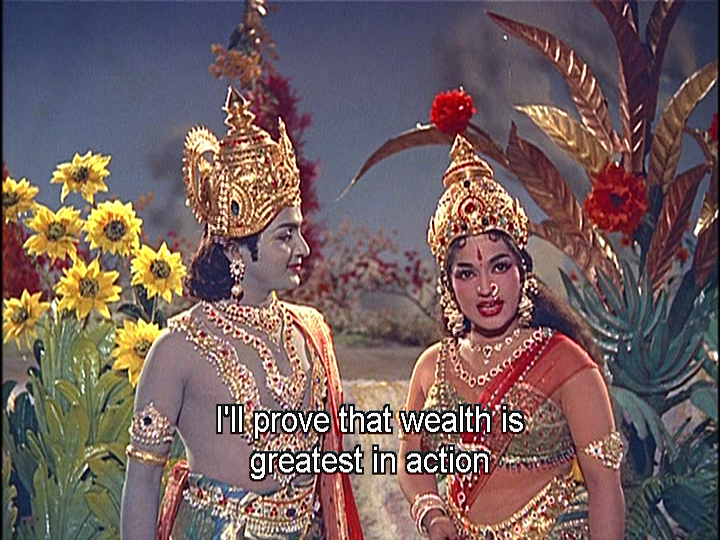 After successfully riling Saraswathi, Naradha heads off to confront the Goddess Lakshmi (Devika) and again causes trouble by telling her that knowledge is more important than wealth. After successfully starting a rivalry between the two Goddesses, Naradha then adds the Goddess Parvati (Padmini) into the mix by claiming that wealth and knowledge are both more important than bravery. Despite some rather lacklustre protests from their husbands, Brahma, Shiva (Harnath) and Vishnu (Sivakumar), and even though they know that Naradha is a renowned trouble-maker, all three rise to the bait. Saraswathi, Lakshmi and Parvati each vow to make a champion for their cause on Earth and prove that their attribute is the most important while making the other two champions bow down before the winner. Generally the different aspects of the three Goddesses are well depicted with Savitri appearing regal and dignified as Saraswathi. She conveys a sense of timeless wisdom in her manner, although still storms off in a huff when she gets annoyed with Naradha. Devika’s Lakshmi is playful and charming while Padmini is motherly to her children but feisty enough to challenge Shiva before Naradha intervenes with his teasing. The three Goddesses are also incredibly sparkly and although Lakshmi manages to out-glitter the other two it’s a close run contest. Saraswathi chooses the mute son of a temple singer to be her champion. She gives Vidyapathi the power of speech and the knowledge to make him an accomplished poet who can sing her praises throughout the kingdom. 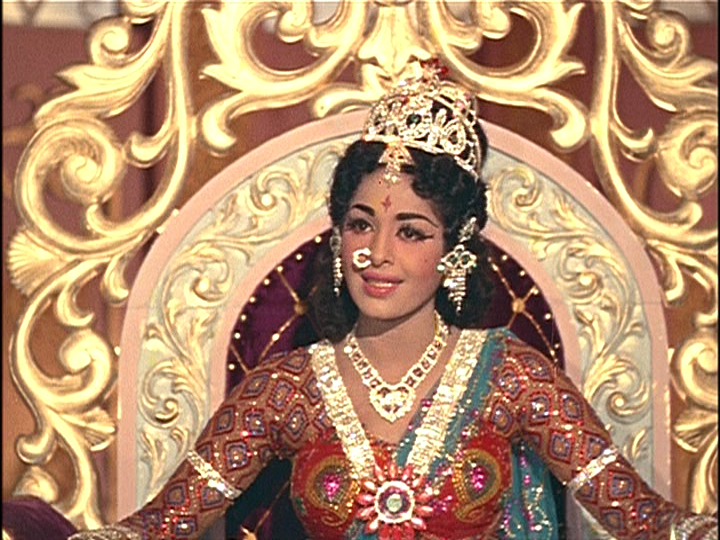 Coincidently choosing the same kingdom, Lakshmi uses her power to make a poor beggar girl queen. The ailing king, who has no heir, decides on a method of selecting his successor which will not open him to claims of favouritism. Acting on advice from his chief minister he gives an elephant a garland and decrees that the person garlanded by the elephant will be the next ruler. 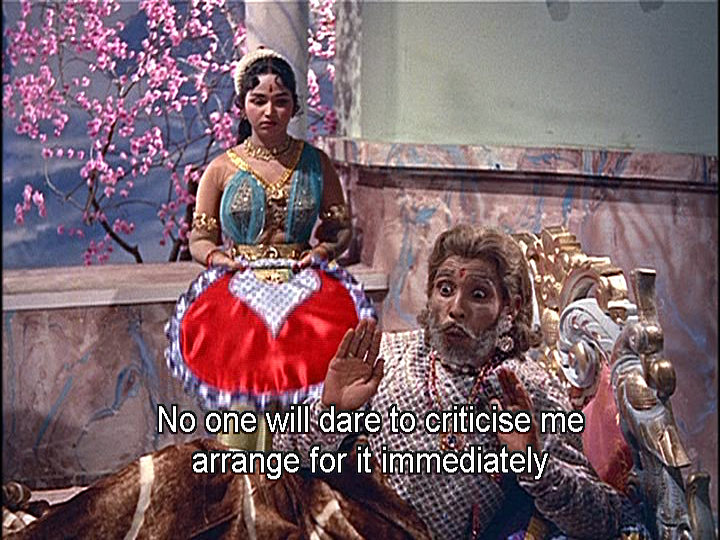 As he says, this is the perfect plan that no-one can object to – except perhaps the elephant who has to chase around after Selvambikar and then throw the flowers over her head. Finally Parvati takes a total coward, Veeramallar (Gemini Ganesan) and turns him into a brave and fearless warrior, who quickly rises to be the new army chief as a result of his prowess in saving the queen when her horse bolts. 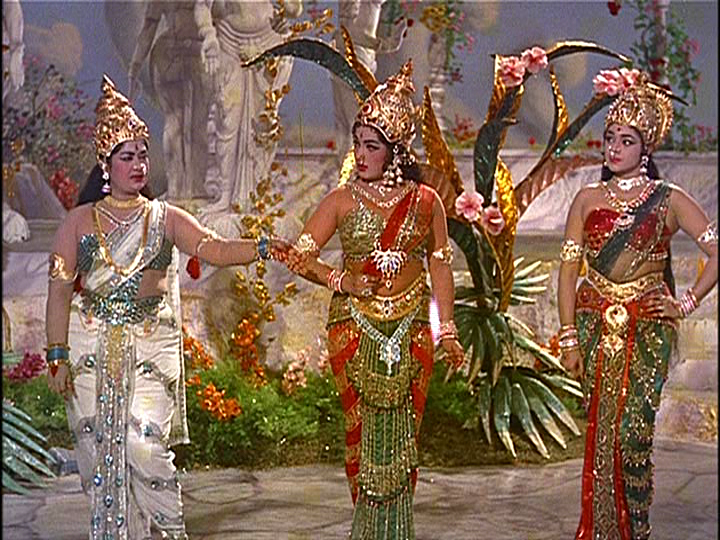 Vidyapathi, Selvambikai and Veeramallar all squabble amongst themselves as the three Goddesses jostle for power. Each character is full of their own importance and their arrogance is well portrayed by the three actors. 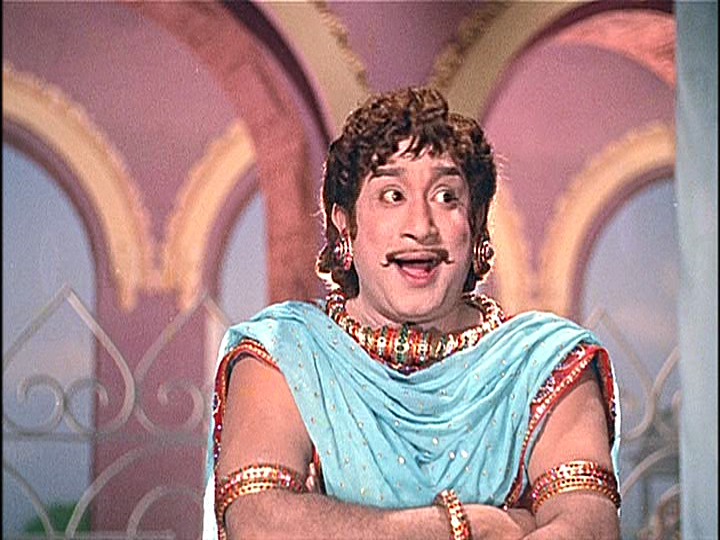 Sivaji Ganesan is excellent as Vidyapathi. His transformation completely changes his personality and he is wonderfully condescending and self-righteous as Saraswathi’s champion. 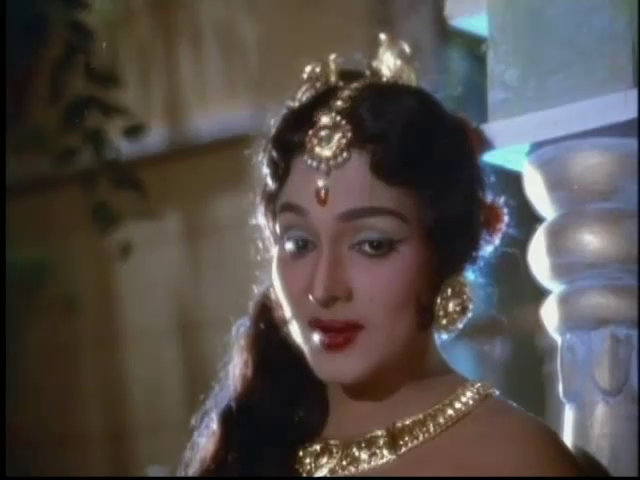 K. R. Vijaya is beautiful, and her change from the poverty stricken beggar girl to haughty queen is just as convincing. Her Selvambikai still has an air of vulnerability despite her arrogance and pride which makes her the most sympathetic of the three and she does also get to wear some lovely sparkly costumes. 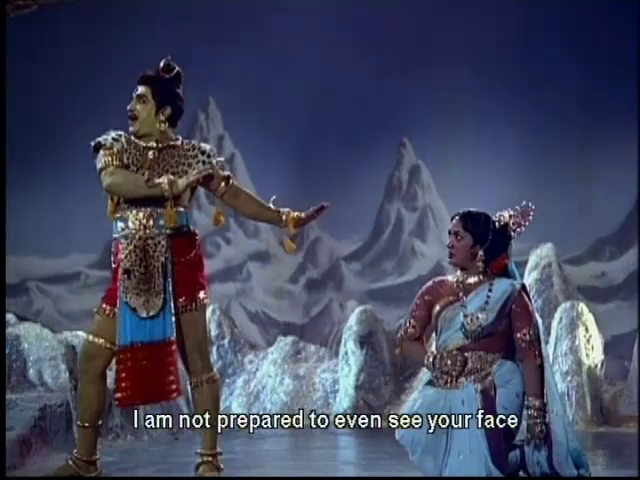 I almost didn’t recognise Gemini Ganesan here compared to the young romantic in Kalyana Parisu but he has plenty of screen presence as the blustering warrior, although his character doesn’t have quite as much background as the other two. 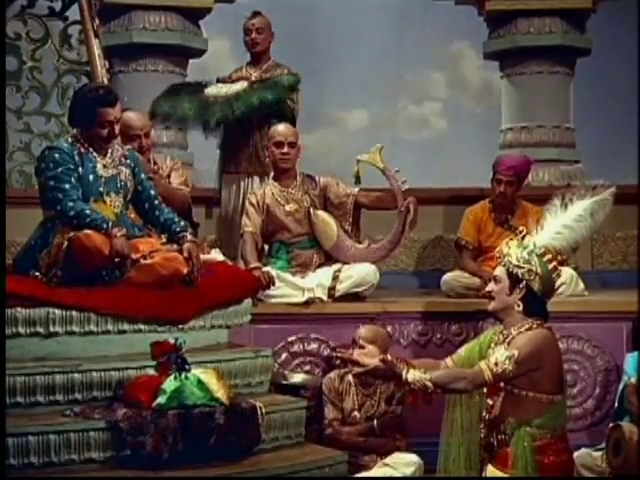 There are clashes between Vidyapathi and Selvambikai as the poet refuses to sing in praise of the queen. 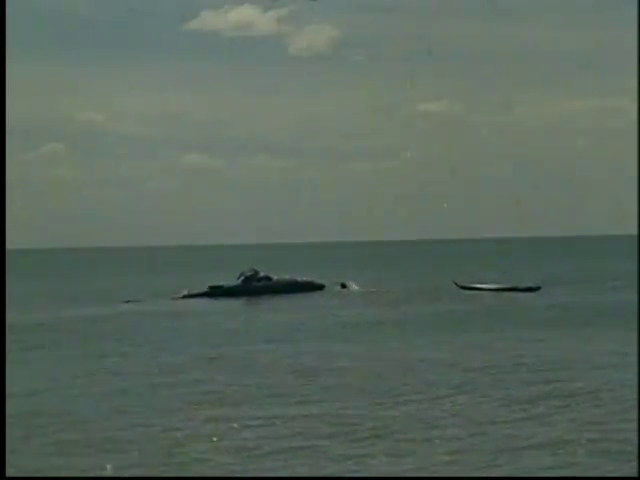 More clashes occur between Veeramallar and Selvambikai as the warrior oversteps his authority, while Vidyapathi and Veeramallar are at odds from the moment they meet. Each embodies the attribute of their patron Goddess and none of them are prepared to back down. Of course it all gets resolved with a suitably moral ending, but it’s the conflicts between the various characters that make the film so entertaining. 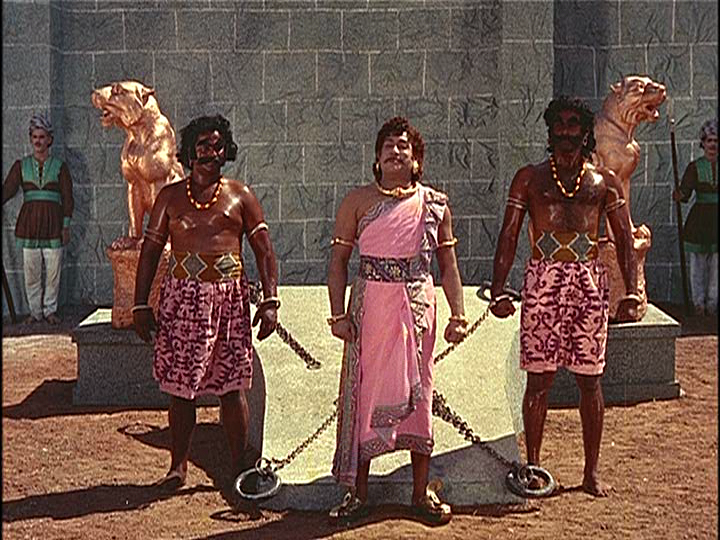 Plus the chance to see Sivaji Ganesan in a pink outfit with matching pink outfits for his guards. 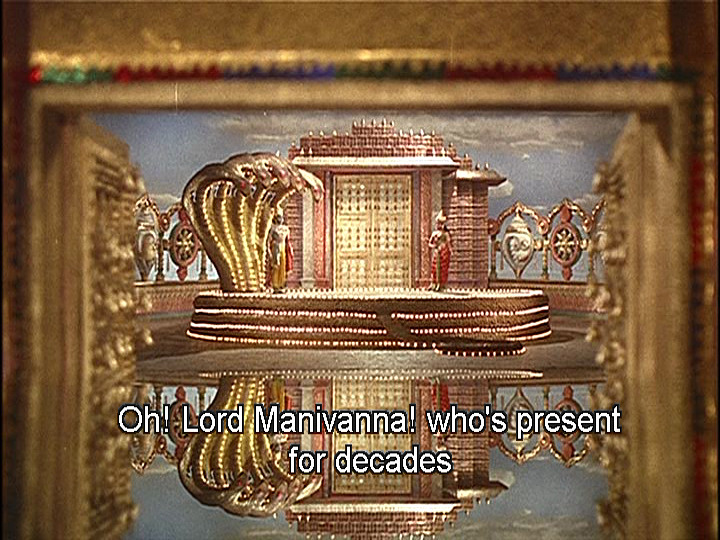 The sets are fantastic and Lakshmi’s heavenly abode is incredibly golden and extravagant. 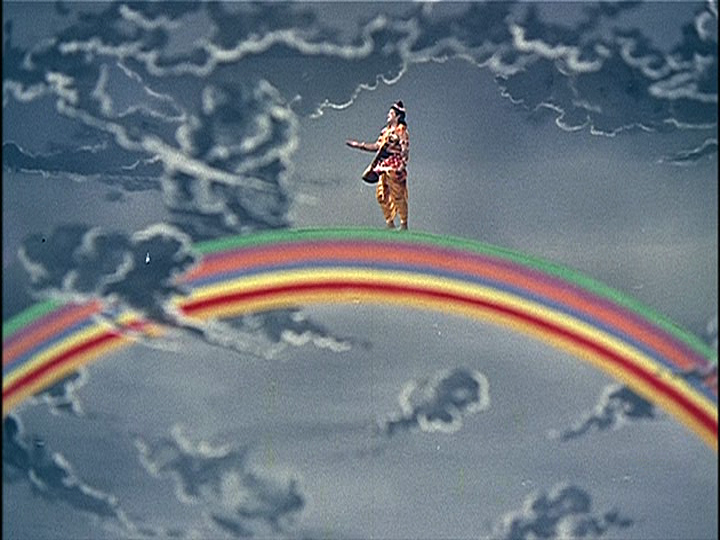 Naradha walks through the clouds (although the rainbow he stands on isn’t one found in nature), and while there aren’t very many other special effects, they tend to be well used – such as when letters appear as Vidyapathi sings about his new ability to speak. There is a comedy track featuring Nagesh and Manorama which fits into the story although Nagesh’s character is more successful. Unfortunately subtitles don’t really convey Manorama’s speech patterns which are the basis for the humour in her character. 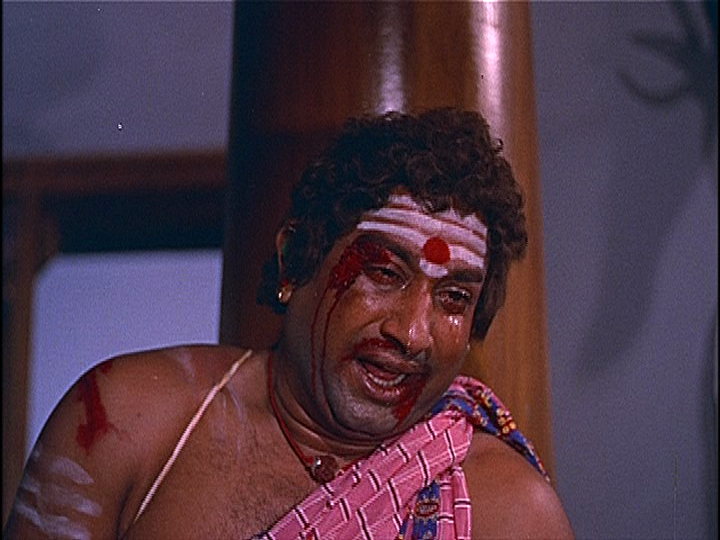 All the lead actors are excellent but Sivaji Ganesan really stands out as both Naradha and Vidyapathi. He has some wonderful expressions and a real twinkle in his eye while he teases everyone as Naradha, and he keeps the character light and mischievous. He has the same liveliness as Vidyapathi but gives a sense of smugness and conceit rather than the teasing nature of Naradha and his anguish and despair as the mute temple worker praying to Saraswathi is very moving. The music by K. V. Mahadevan is beautiful and the lyrics by Kannadasan work well even in their English translation. As always I would have liked a little more dancing, although there is a short piece of Bharatanatyam by Padmini to enjoy. It’s probably not a film for everyone’s tastes as the story develops slowly and there is a lot of wordy interplay between the characters to establish the conflict. 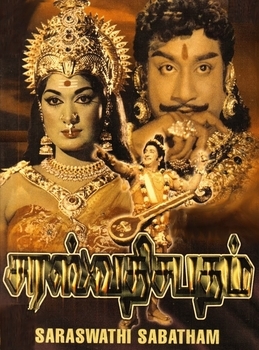 However for fans of Tamil mythological films, A. P. Nagarajan takes a simple story and aided by excellent performances from his all-star cast makes Saraswathi Sabatham an entertaining and appealing watch. 3 ½ stars. 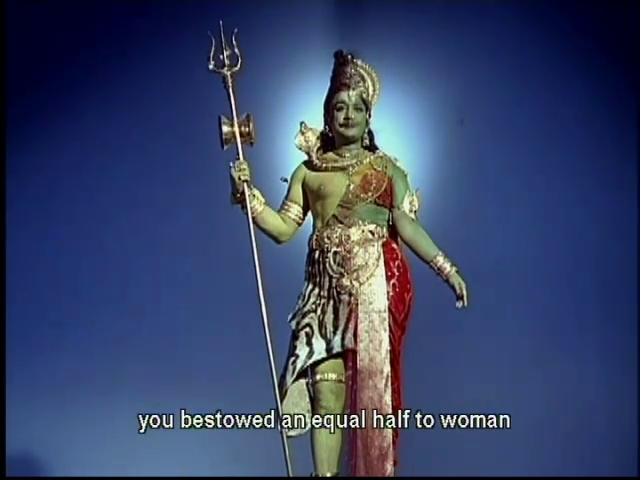 Thiruvilayadal is a wonderfully embellished pastel confection of a film, supported by a powerful performance from Sivaji Ganesan as Shiva. Thank you to Suja and Ajit for their enthusiastic recommendations. 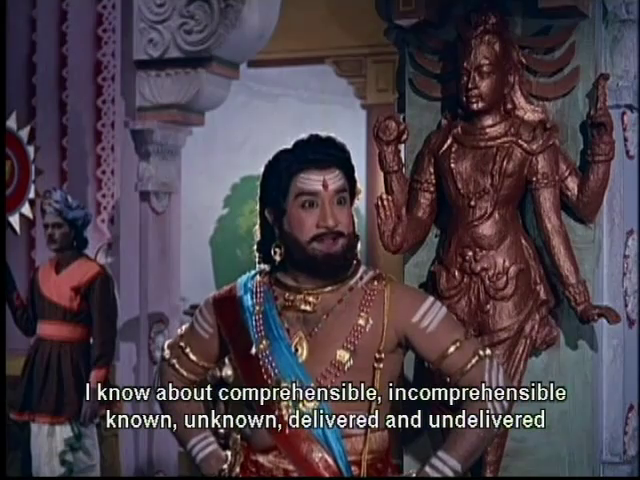 I am also very grateful to the rajshritamil channel on Youtube for making the film available with subtitles. 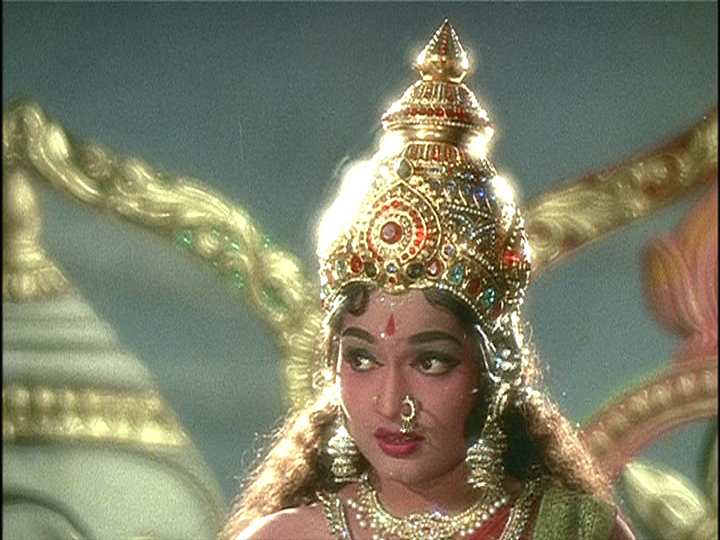 Suja asked how meaningful or interesting a vintage devotional film would be to a non-Hindu? The answer is – very! I was raised Catholic which, as a friend said recently, is the glitzy end of Christianity. Catholicism incorporates numerous saints, some having their own specialities or areas of influence so the faithful can pray to the one best placed for their situation. They are identifiable by different visual elements and props, often referencing a gruesome means of death if the saint had been martyred. So the colour, pageantry, stylised imagery and iconography of a devotional film are familiar elements for me even though the philosophy and faith are different. 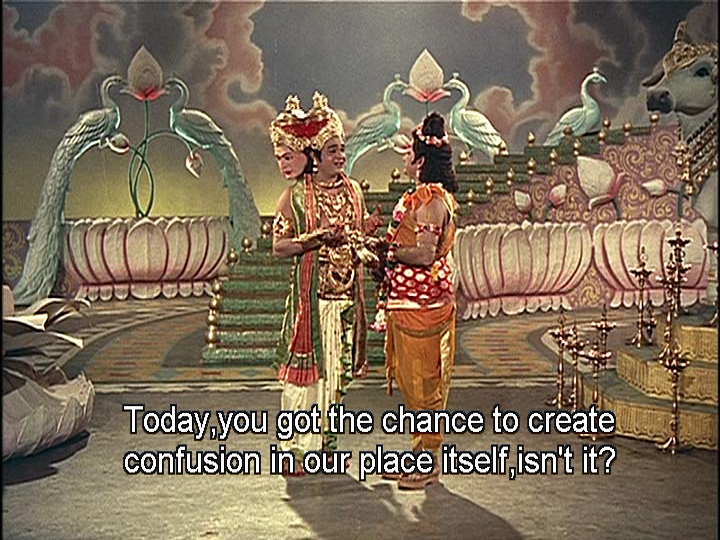 One of the biggest differences is something I remarked on after watching Mayabazar. The relationship with God as depicted seems a lot more direct and personal than I am used to. And Shiva is not immune from displaying vanity and caprice as well as humour and tolerance, so I found it a more human interpretation of God. Anyway, the story begins as a resplendent Shiva (Sivaji Ganesan) receives the praise of his devotees, including his wife Parvati (Savitri), which promotes that groovy mood. Even divine families have their squabbles and a contest between Ganesh and Murugan ends when Ganesh uses his erudition to define the question and win the prize. Murugan is incensed by losing to his sibling and leaves home. Parvati tries to persuade Murugan to return, and explains that it is Shiva’s way to test his devotees. 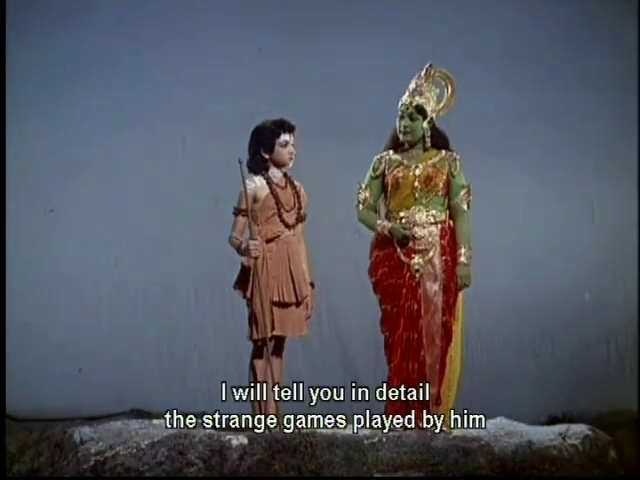 She narrates several stories of Shiva’s ‘games’ to persuade her son that there was no insult intended. The stories are very entertaining and the format allows different aspects of Shiva to be explored in array of visually delightful settings. Again, the theme of God testing the faith of an individual is a familiar one to me, but the style and methodology do differ. 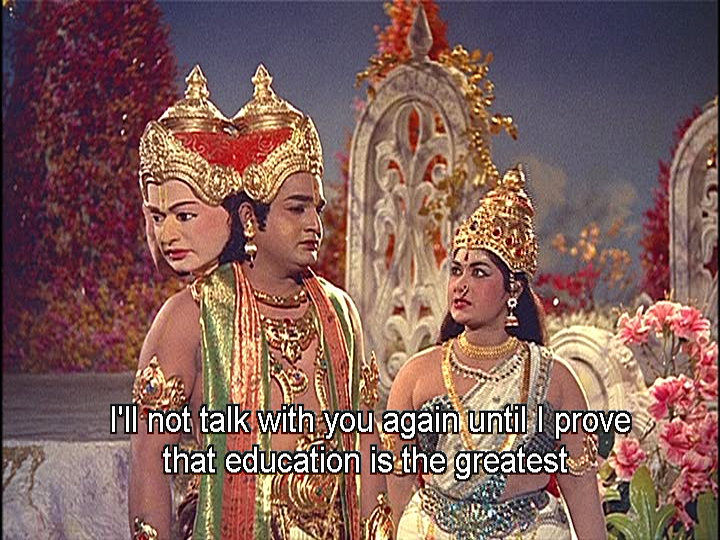 Shiva tests the knowledge (and ego) of a renowned scholar and teases a poor poet. Both get their rewards, but for Shiva the reward seems to be the fun of the game. 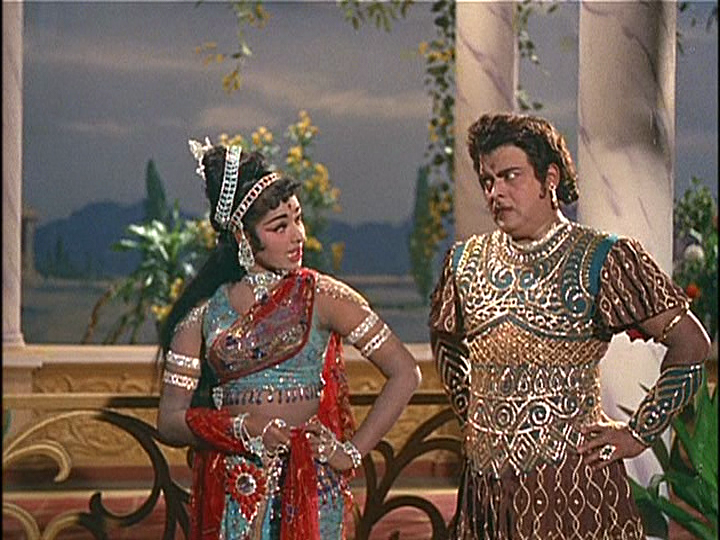 And for the viewer, we get an answer to the vexing question ‘Does a woman’s hair possess a natural perfume?’ Muthuraman and Devika are lovely as the King and his glamorous queen, and their ornate palace is stunning. 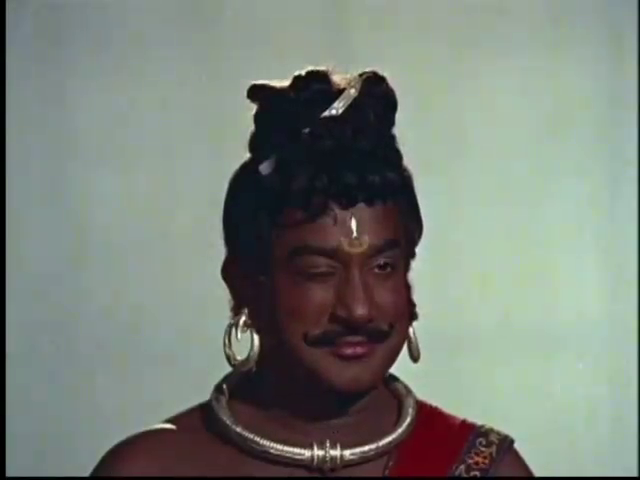 Sivaji Ganesan revels in the role, exuding a majesty and playfulness that makes him compelling. He is not what I would call handsome but he is absolutely magnetic. His larger than life style is perfect for Shiva. 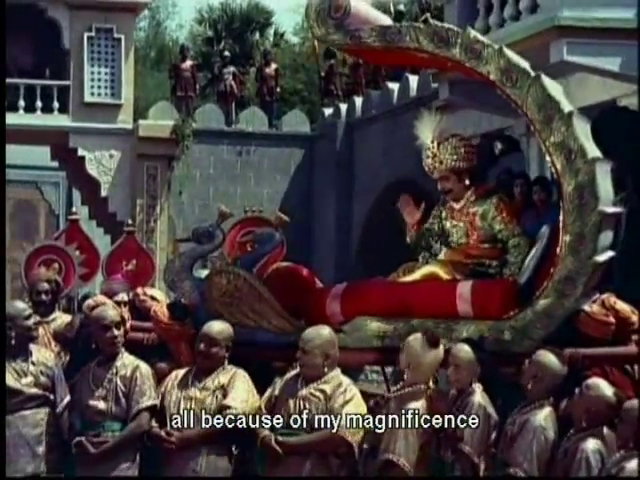 I love this song, performed by Shiva posing as a firewood vendor. An arrogant musician challenges the Tamil court to best him, and the kingdom is at stake. 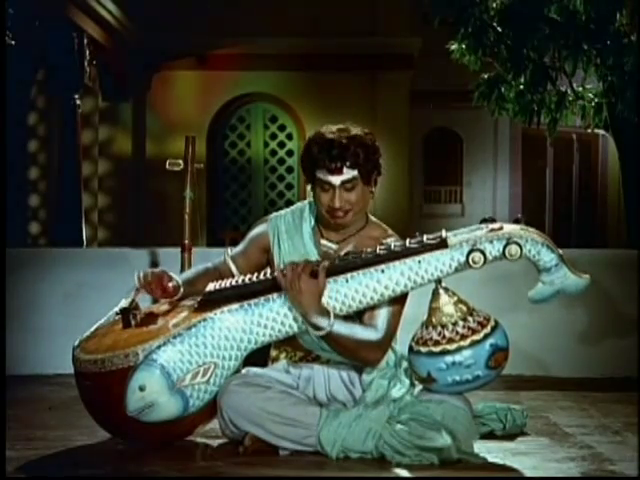 Shiva sets up outside the musician’s residence and psychs him out before the contest by singing a song so perfect it stops the birds in the air and the waves in the ocean. Even if you don’t love the music as much as I did, watch this clip for Shiva’s exuberance and joy in creation and art, and his pleasure in being really annoying. 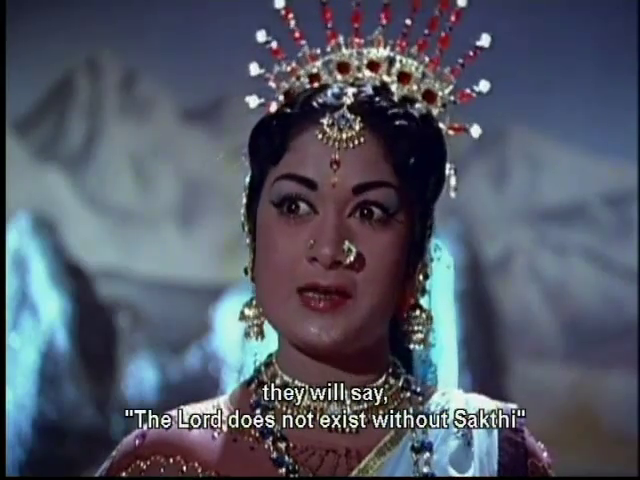 Savitri is regal and composed as Parvati. She has endured Shiva’s whims for aeons. She is his equal in temper, but he wields his destructive power without fear of consequences where she is more restrained. Once, after momentarily diverting her attention from her husband to her son, she was punished by being born in a fishing village with no memory of her divine nature. I think that was a harsh reward for good parenting. Parvati showed herself to be a leader in a human incarnation while in the village. 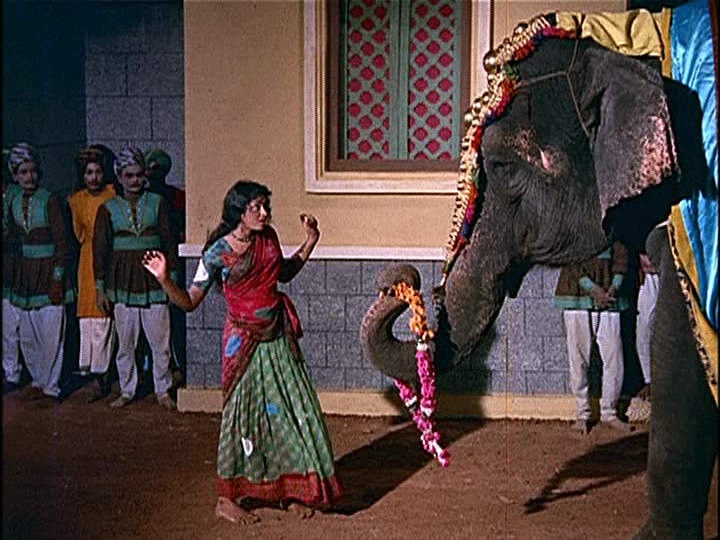 I also enjoyed seeing Manorama as one of her girlfriends. Of course Shiva wasn’t going to let anyone else win his wife in the ‘he who is bravest’ competition, so he appeared as a mysterious heroic fisherman. Their flirting was cheesy but lots of fun. 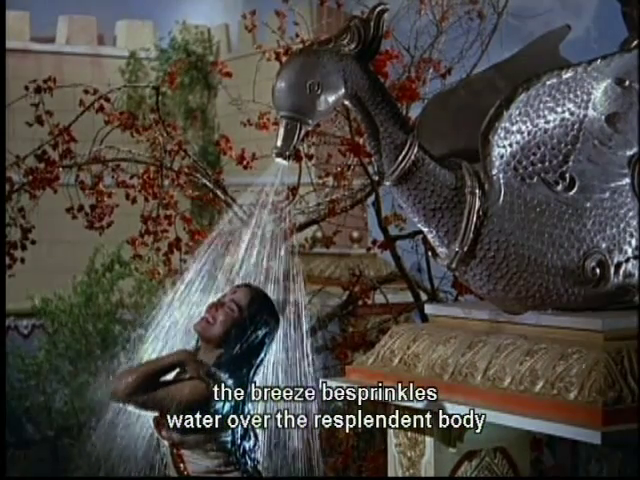 And this episode includes one of my favourite filmi things. A shark fight! 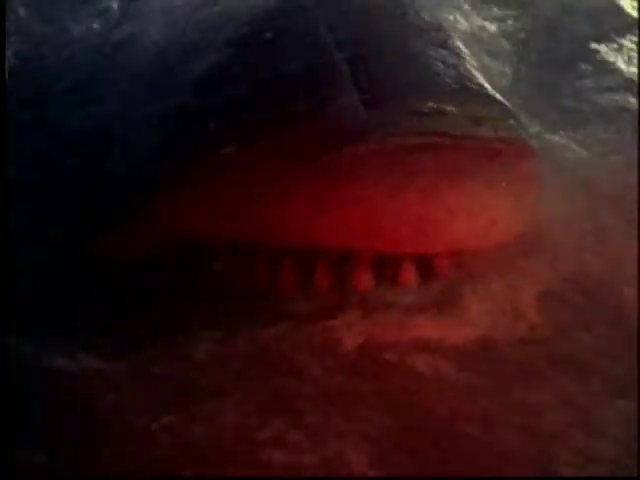 Admittedly it is more like a rubber whale with dentures in some shots, but look upon the mighty beast and despair! 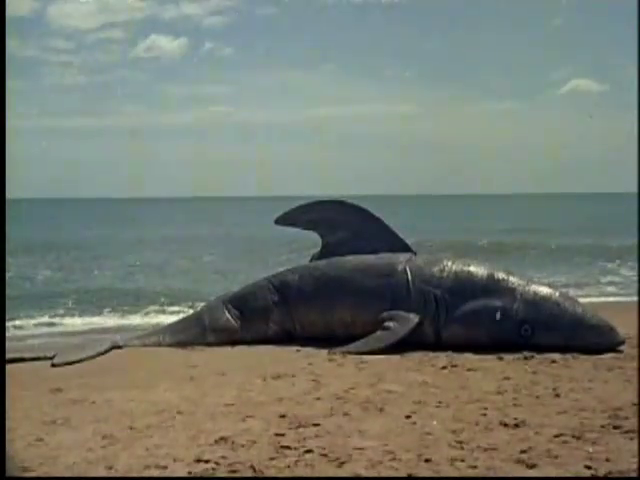 Shiva defeated the shark, won the girl and kindly restored her to her former glory. The comedy is character driven and fits into the main narrative. 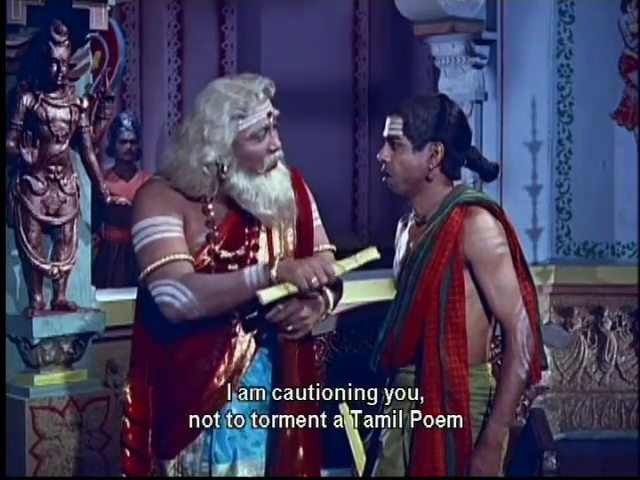 Nagesh plays a poor poet who becomes a pawn in Shiva’s game. His mix of rapacity and naivete is funny without being too much. Shiva’s answers to questions by mortals are often a witty partial truth or play on words. It’s a sprightly and engaging film. The senior gods intervene and remind Shiva that without her the world becomes barren and dark and he relents and restores her. There are a couple of dialogue exchanges about how all women must submit to their husbands that seem at odds with the theological position. I wonder if it was translation that chose ‘submit’ when the actual word was more nuanced, or if it reflects other beliefs. This image seems to support a balance rather than the dominance of one aspect suggested by the script. There is a strong theme of the purity and beauty of Tamil language and culture and Shiva rewards those who love and protect the tongue. 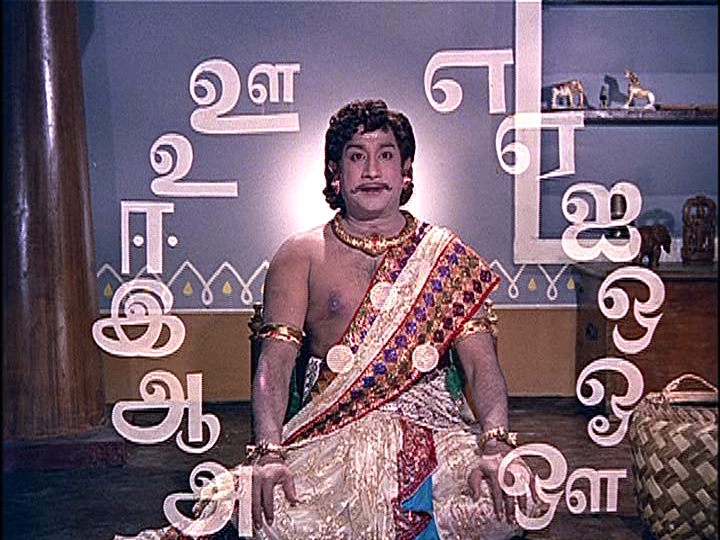 Many key supporting characters are Tamil scholars and are accorded great respect and some indulgence by the gods. 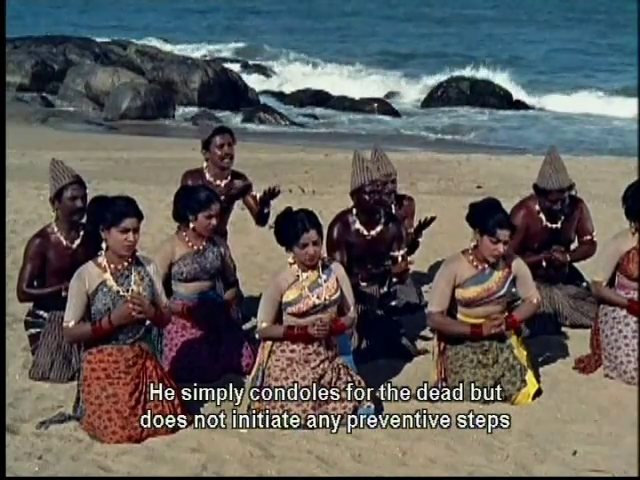 Since this is from the 60s maybe the positioning of Tamil culture and language as superior and preferred by the gods was a reflection of the Dravidian movement or other factors? I’m sure someone will tell me. K.V Mahadevan’s music is not only enjoyable but is integral to the stories. The art design is just wonderful. There is such a wealth of beautiful detail, right down to treasures like the fish themed musical instruments and a fabulous bird shower. The central performers are brilliant, the stories are engaging, and it is a pleasure to see and listen to. There is so much to enjoy in Thiruvilayadal whether you watch it as a colourful entertainment or with a more philosophical analysis. 5 stars! Heather says: This is a simply a beautiful film. The colours are amazingly bright and it is incredibly iridescent and sparkly throughout. 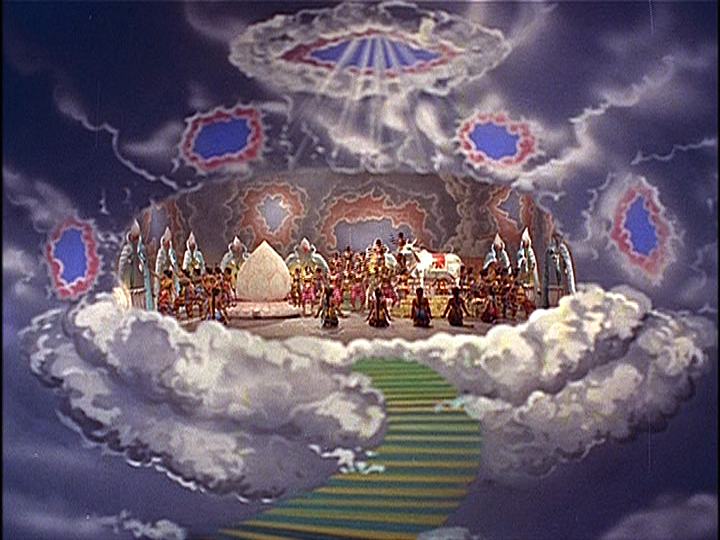 From the opening song and dance until the very end it is captivating with beautiful music and stunning performances. 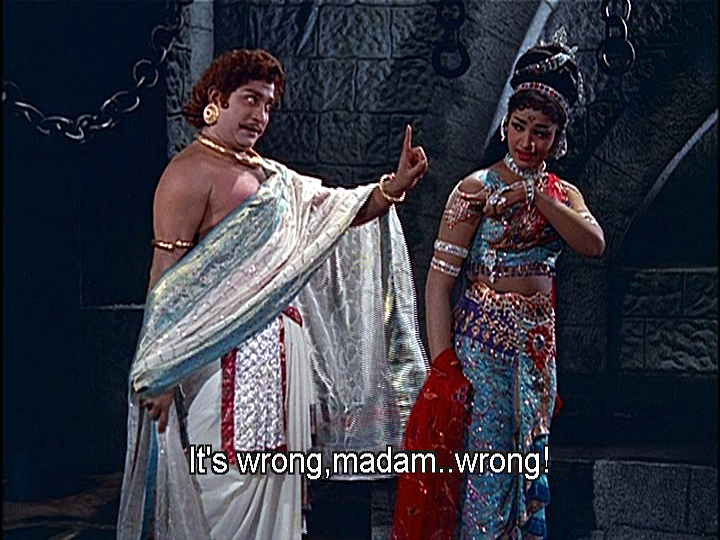 I think this was the first film I saw with Sivaji Genesan and he seems to be the perfect person to play Lord Shiva. He has such charm and brings so much character into the role. I particularly love his Tandava dance after the death of Sakthi where his facial expressions are superb and I love that he dances with his eyes. My dance teacher keeps telling me this is how to dance properly, and this is the perfect example of how much it brings to the performance. Even if as temple points out he’s not technically perfect otherwise. My favourite story is the one about the musician Hemanathan and the song above where there are multiple Lord Shiva’s playing different musical instruments is brilliantly done. 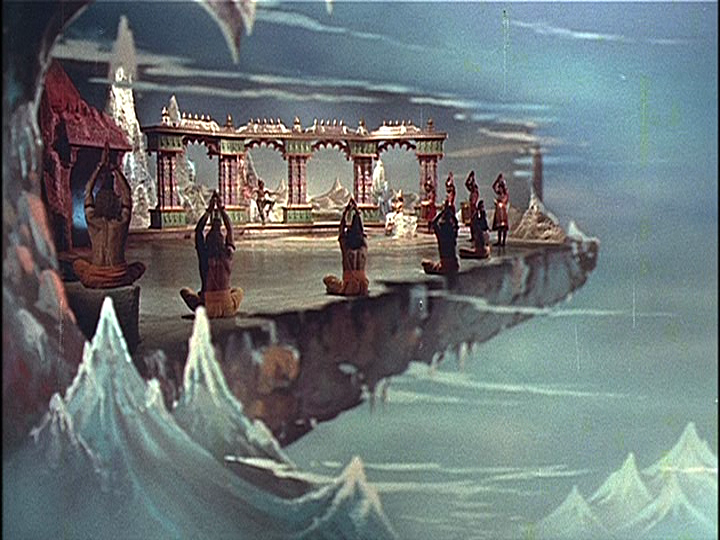 Considering the film was made in the sixties and the special effects were presumably rather limited, it’s all put together very well and creates a magical effect every time I see it. 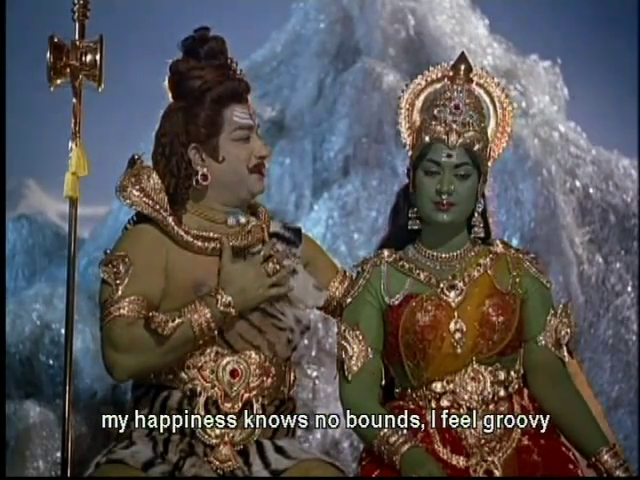 And I totally agree with Temple’s comments about the subtitles – the ‘I feel groovy’ perhaps is showing the influence of the sixties, but some of the rest I have no explanation for at all. There is at times so much detail in the film that at times it distracts a little from the main action for me. The backing musicians during Hemanathan’s performance have amazing facial expressions and really get into the music. I tend to end up watching them and the various other servants and hangers-on rather than concentrating on the lead characters. But then again, so much of the detail is charming. There is the fish tika on Kayarkani’s forehead as the fisherman’s daughter, the wonderful peacock chariot that carries Hemanathan to the Pandian King and Shiva’s third eye that blinks just to name a few. Thiruvilaiyadal is an absolute classic, and as a friend said when we were discussing the film, it’s one to watch again and again. 5 stars.